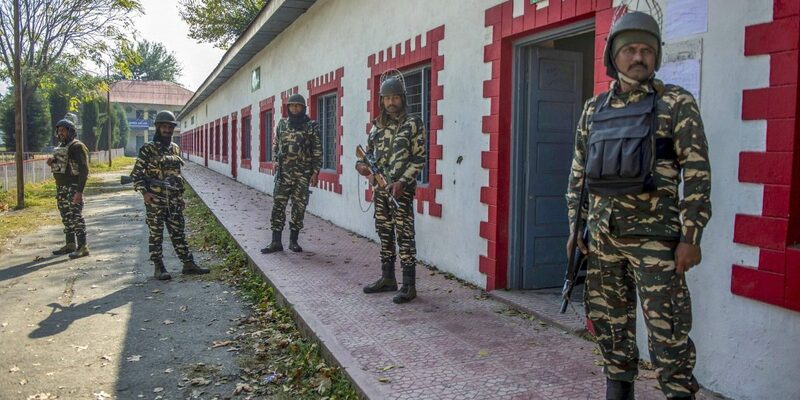 Srinagar: For paramilitary troopers called for election duty in Kashmir for the first time, deserted polling booths and a “gloomy atmosphere” was “surprising” as the region witnessed the third phase of elections to urban local bodies on Thursday. In the two phases of elections held so far, the voter turnout has remained in the single digits across the Valley. In fact, it plummeted to 3% during the second phase compared to 8% polling during the first phase. This abysmal voting percentage or total absence of the electorate from the booths was even noticed by CRPF troopers at many a booths in the summer capital of Srinagar. At a polling station in uptown Lal Nagar, zero voters during the first six hours of polling was “unbelievable” for a CRPF trooper from Bihar’s Vaishali district – voting in Srinagar starts at 6 am, half an hour before sunrise. The presiding officer corroborated Ram’s remarks. There are total of 1,254 registered voters at this booth, he said at 12:30 pm, but not a single voter has turned up so far. As I walked out, the trooper continued, smiling. “I wasn’t wrong. We too are waiting for somebody to turn up,” he said, as another trooper, a burly and moustached man standing next to him, burst into laughter. He was from Uttarakhand. What did they think of the voters staying away? “It is unbelievable, to say the least,” said Ram. In his 20 years of service, he said he has been sent to polling duty in at least three states. “There, the voters’ queues won’t end and a single man from home guard (force) would control the entire situation. But you look around here and it is only our men and polling staff, nobody else,” he said, as the entire area around the booth had been turned into a garrison. The trooper from Uttarakhand, who didn’t reveal his name, interrupted Ram. “But you should be thankful that there is no violence this time and elections are going on peacefully. Had you been here for election duty in 2017 April, it was very tough. There was stone-pelting all around,” he said, referring to by-elections to the Srinagar Lok Sabha seat during which nine civilians were killed in clashes between protestors and forces in Budgam district. While Ram seemed to be quite aware about the Kashmir problem, he didn’t talk about it directly. “Staying away from any democratic process, be it elections, is also a means to register your dissent and tell others that there is something wrong. This will also convey your message. You need not to resort to violence,” he responded to his colleague. “I have a deep interest in learning about our country’s history and political struggle,” he said. He said soon after completing his BA in English literature, he was recruited to the CRPF. The trooper talked with pride about his district and said Vaishali was “world’s first republic and the first place where democracy found its origin”. The Srinagar Municipal Corporation is spread over 74 municipal wards. During the first and second phase of polling, the wards which went to polls registered 6% and 2% polling respectively. Today, the polling percent, as per latest figures issued by state election body, was 1.5%, the lowest so far, at 3 pm. The city has traditionally boycotted the polls and this time too people preferred to stay indoors. Held after 13 years, the civic body polls are being conducted under complete secrecy with state election body keeping names of candidates and parties they are fighting for a complete secret amid threats by militants. At most of the places, locals had no idea about the location of polling booths, an indication of disinterest towards the entire electoral exercise. There were four other polling booths set up in area adjacent to Lal Nagar. The polling situation there was the same. “There is zero voting at all these polls,” a police official collating details about turnout at the booths told The Wire. One of these four booths had been set up deep inside the locality in another government office. There, a group of eight CRPF men were busy discussing the boycott with a polling agent. “This must be the first place where people choose not to elect their representative. Why is it so? It is bemusing. In other states the elections are like festivals, but here it is so gloomy,” a CRPF trooper asked the polling agent, hired by an independent candidate. “It has been like this for years,” the agent responded, while informing somebody on his mobile that no vote has been cast at the booth. “You are from the media, you must know the reason for people boycotting the elections,” a CRPF trooper asked me. He was, however, snubbed by his senior for “engaging in political discussions”. “Our job is to provide security, not discuss politics,” the senior told the trooper as his colleagues chuckled. At Chanapora, a higher secondary school had been turned into a polling station. 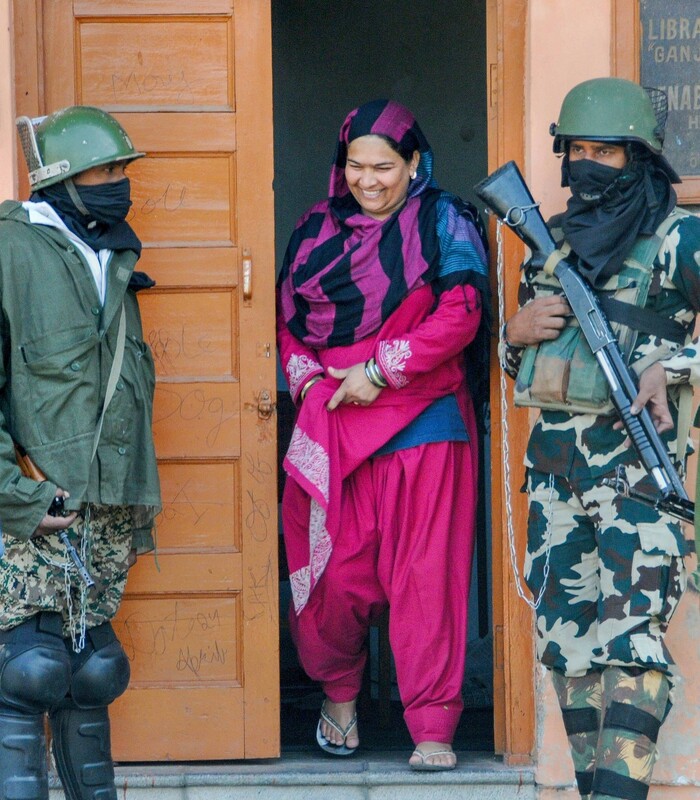 A group of CRPF men cracked jokes at just two votes cast till late afternoon. “This is injustice. What if two candidates get a vote each? It will be a tie and we will be again called for poll duty,” said head of the CRPF party who identified himself as Sohan Gupta from Solan in Himachal Pradesh. Though Gupta said he has 30 years of service in CRPF and has been deputed to Kashmir twice – from 1999 to 2002 and in 2012 – this was his first poll duty in Kashmir. Like his colleagues at other booths, he too was eager to know the reason behind the boycott. “But it is good for us in a way. We have nothing to do and that means no tension,” he remarked. The city centre of Lal Chowk, which also went to polls today, had been turned into a garrison. At four polling stations set up in and around the commercial hub. just 57 votes had been polled by 3:30 pm. But the CRPF men on duty were hardly bothered about the turnout. “The good thing is that situation has remained calm. We are hardly bothered about who wins or loses,” said a trooper who identified himself as Mahesh, on his third poll assignment in the Valley. “This (low turnout) has always amazed me. There must be a way to attract people and make this (electoral) exercise interesting. Or isn’t there a one?” he asked and disappeared into the lane leading towards the booth. Mudasir Ahmad is a Srinagar-based reporter.